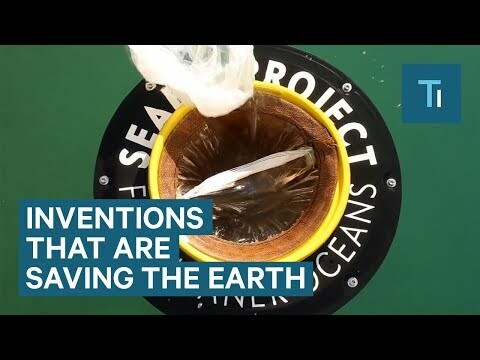 Seabin collects garbage from the sea. Seabin has a pump that creates a flow of water. The garbage is caught in a bag, allowing water to flow out back to sea. This machine crushes beer bottles into usable sand. 200 grams of powder from each bottle is recycled to preserve beaches. SaltWater Brewery is an edible packaging to save sea life. The six-pack rings are made of barley and wheat. Sea life can eat the rings safely. It can turn air pollution into ink. It collects carbon soot from a car’s exhaust. Then it is processed into a high-quality black ink. These edible water blobs are biodegradable. The capsule is made from a seaweed extract. It is a greener solution to creating waste-free packaging. The Ocean Cleanup machine has a giant floating pipe to capture plastic. The pipe moves with the waves and has floating anchors. The plastic are gathered in the center for a boat to remove. Avani’s biodegradable bags are saving sea life and reducing ocean pollution. They are made from cassava root and natural starches; making them harmless for animal consumption. This machine recycles tires. The tires are turned into rubber crumb for artificial grass. It is a combine process of fish farming and hydroponics. As the fish eat and grow they produce waste. The wastewater is given to plants as a fertilizer. The plants absorb the nutrients in the water and they are returned to the fish tanks. A natural process to growing food. It turns food scraps into cooking gas. The gas flows from the system directly to the kitchen stove. It can be fed up to 6 liters of waste and digest almost anything. HomeBiogas can also create fertilizer that goes back into soil. Next story At the Parque Safari zoo in Chile, you are the one inside the cage; not the animals!